We love to see cycling in the Springfield community. Since 1987, we’ve committed ourselves to serving cyclists of all ages and skill levels and there’s nothing we’d rather be doing (except riding our own bicycles of course). We’re here to get you started, keep you going, answer your questions or help you with your next steps should you want to reach further. Our staff are all avid cyclists who enjoy the opportunity to help others get involved in the sport. We sell and service it all. From fully assembled bicycles, parts, accessories, water bottles, clothing, helmets, bags, pumps, bike computers, sunglasses, tires, tubes, repair kits, chain oils and nutritional supplements to selected exercise equipment. Bicycle brands we sell are Cervélo, Raleigh, Schwinn, Diamondback, GT, Marin and Scott. 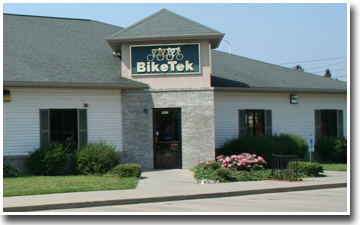 Our shop can service repairs of any type from regular maintenance, tune-ups, tube leak repair and squeaky brakes to truing wheels, assembling bicycles or performing equipment upgrades. We love working on bicycles almost as much as we love riding them. Please stop in and visit our showroom. 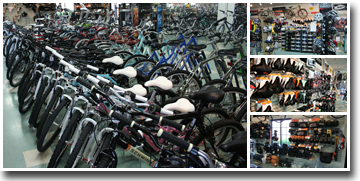 We have a large inventory of parts, accessories and bikes of all sizes.